When the rapid pace of technology innovation meets the unique use cases and context of mobility, designers are often faced with many relatively simple problems with a multitude of potential solutions, while the more complex and nuanced customer needs are not so easily addressed. Automation and autonomy remain our inevitable fail safe solutions, but without robust methods to explore, validate, and prioritize our technological pathway to a fully-autonomous future, people will find it increasingly more difficult to drive cars. Let’s explore how user experience designers can enhance vehicle development by bringing human-centered methods to the complex process of designing the mobility solutions of tomorrow. 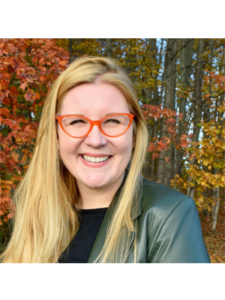 Emily Bowman is a Design Group Manager at General Motors where she leads user experience innovation and a team of product designers crafting the future interfaces for electric and autonomous vehicles. Throughout her design career, she has leveraged user-centered methodologies to help global brands like Jaguar Land Rover, Kimberly-Clark, Ford, and Intel create useful and usable experiences through cars, phones, wearables, and the web. Whenever she’s not at GM, Emily is an active volunteer in the Michigan UX community.